In 1666, an astronomer makes a prediction shared by no one else in the world: at the stroke of noon on June 30 of that year, a solar eclipse will cast all of Europe into total darkness for four seconds. This astronomer is rumored to be using the longest telescope ever built, but he is also known to be blind—and not only blind, but incapable of sight, both his eyes having been plucked out some time before under mysterious circumstances. Is he mad? Or does he, despite this impairment, have an insight denied the other scholars of his day? These questions intrigue the young Gottfried Leibniz—not yet the world-renowned polymath who would go on to discover calculus, but a nineteen-year-old whose faith in reason is shaky at best. Leibniz sets off to investigate the astronomer’s claim, and over the three hours remaining before the eclipse occurs—or fails to occur—the astronomer tells the scholar the haunting and hilarious story behind his strange prediction: a tale that ends up encompassing kings and princes, family squabbles, obsessive pursuits, insanity, philosophy, art, loss, and the horrors of war. 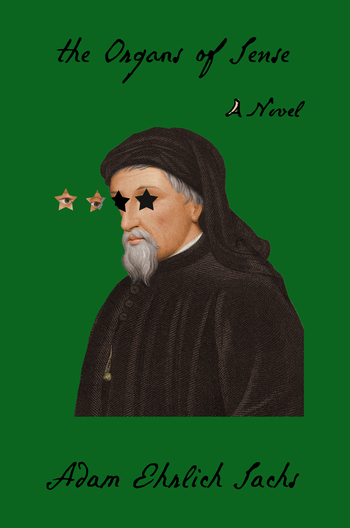 Written with a tip of the hat to the works of Thomas Bernhard and Franz Kafka, The Organs of Sense stands as a towering comic fable: a story about the nature of perception, and the ways the heart of a loved one can prove as unfathomable as the stars. Adam Ehrlich Sachs is the author of the collection Inherited Disorders: Stories, Parables, and Problems, which was a semifinalist for the Thurber Prize for American Humor and a finalist for the Sami Rohr Prize for Jewish Literature. His work has appeared in The New Yorker, Harper’s Magazine, and n+1, among other publications, and he was named a 2018 National Endowment for the Arts Literature Fellow. He has a degree in the history of science from Harvard, where he was a member of The Harvard Lampoon, and currently lives in Pittsburgh, Pennsylvania.